Aerospace engineers need top-flight resumes. Check out this sample for a midlevel aerospace engineer for ideas on how to give your resume some lift. As an aerospace engineer, you should have a top-flight resume, says resume expert Kim Isaacs. For ideas on how you can give your own resume some lift, check out this sample resume for a midlevel aerospace engineer that Isaacs created below. 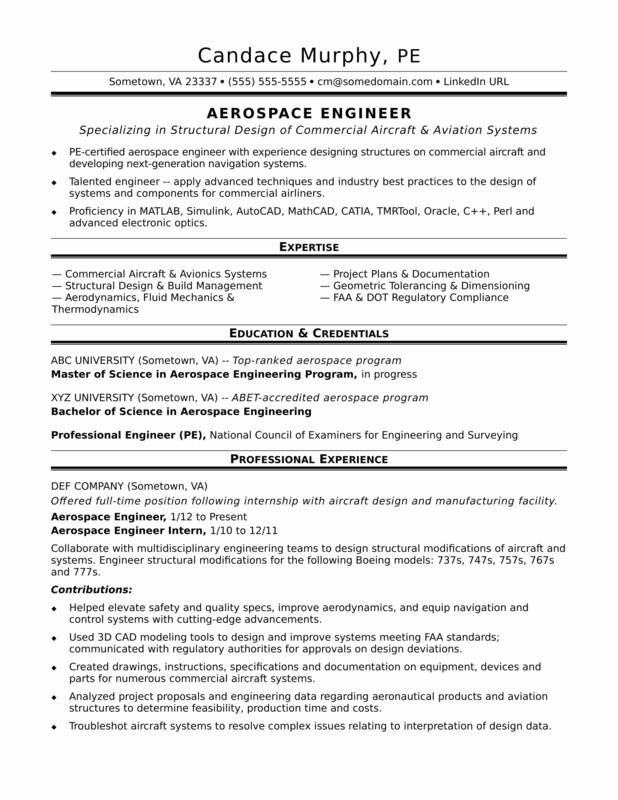 You can also download the midlevel aerospace engineer resume template in Word. And if you need more help, let the experts at Monster's Resume Writing Service create a high-impact resume for you that will impress employers. Jobs for aerospace engineers are projected to grow by 6% (or 4,200 jobs) from 2016 through 2026, according to the Bureau of Labor Statistics (BLS). You'll find the highest level of employment for this job in the following states: California, Texas, Alabama, Ohio, and Maryland; and in the following metropolitan areas: Huntsville, AL; Los Angeles; Houston; Washington D.C.; and San Jose, CA. As an aerospace engineer, you can expect to earn a median wage of $113,030 per year, or $54.34 per hour, according to the BLS. Additionally, you can learn about engineering careers and search for aerospace engineer jobs on Monster. PE-certified aerospace engineer with more than four years of design structures experience on commercial aircraft and next-generation navigation systems. Talented engineer -- apply advanced techniques and industry best practices to the design of systems and components for commercial airliners. Proficiency in MATLAB, Simulink, AutoCAD, MathCAD, CATIA V5 and V6, TMRTool, Oracle, C++, Perl and advanced electronic optics. Offered full-time position following internship with aircraft design and manufacturing facility. Collaborated with multidisciplinary engineering teams to design structural modifications of aircraft and systems. Engineered structural modifications for the following aircrafts: Boeing 737s, 747s, 757s, 767s and 777s. Helped elevate safety and quality specs, improve aerodynamics, and equip navigation and control systems with cutting-edge advancements. Used 3D CAD modeling tools to design and improve systems meeting FAA standards; communicated with regulatory authorities for approvals on design deviations. Created drawings, instructions, specifications and documentation on equipment, devices and parts for numerous commercial aircraft systems. Analyzed project proposals and engineering data regarding aeronautical products and aviation structures to determine feasibility, production time and costs. Troubleshot aircraft systems to resolve complex issues relating to interpretation of design data.